Apple's iPad embodies Dieter Rams' famous Ten Principles for Good Design, the ten commandments that every company should follow before manufacturing any product. It feels like the future in your hands. But it could be better. The iPad is the culmination of Jon Ive's quest for the ultimate industrial design, a search for the minimal minimalism, reducing an entire mobile computer to just a screen with no keyboard—a slice of glass, aluminum, silicon, copper, and gold, following the Gospel of Rams. But the final product has some problems, some related to marketing choices, some related to manufacturing decisions. The concept of a touch screen device that eliminates the need for mice is not new, but the iPad uses innovation on touchscreen technology manufacturing to have a larger size at a price affordable enough for a mass consumption product. This advancement provides with its core functionality, allowing for a new generation of applications with enough power and functionality to replace a laptop. Its function defines its form, a simple screen to present the actual tools. In fact, its design enables the product to be. The iPad is beautiful. The black, glass and the aluminum, its proportions, the sightly curved back and integrated bezel, which makes it look and feel thinner than what it actually is. The iPad is self-explanatory: The moment you turn it on, the interface pops up and takes center stage, inviting you to slide your finger, to click. There's no need to learn a new language to interact with the computer. The home button only takes one press to realize what it does. The same is true with the power, volume, and screen orientation lock. Each element of its design has an unequivocal function. No other Apple product has met Rams' Commandment as completely as the iPad. Rams said that well designed products are "neither decorative objects nor works of art. Their design should therefore be both neutral and restrained," allowing for self-expression. This is exactly what this mobile computer does. There are no artificial additions in this machine. Everything in it is function-driven, and no decoration makes the product look any different from what it really is. While it feels like a device from the future, its design is timeless. I can imagine it in a set of Stanley Kubrick's 2001 and it would look at home. I can leave it on a wooden desk inside a baroque palace, and it would blend just fine. Captain Picard can bring it to the bridge of the Enterprise, and it would feel natural in his hands. Every detail in the iPad is designed with its function in mind. One example is the iPad's bezel, which makes possible to hold the product firmly and securely without the hands getting over the user interface and confusing the touchscreen. Unlike the original iPhone, and according to Apple, the iPad is recyclable and uses green materials all around: Arsenic-free display glass, Bromide Fire Retardant free, mercury-free LCD display, and no PVC. In Rams' words, good design is purity and simplicity. I can't imagine this kind of product getting purer and simpler than this. But even while Apple's new mobile computer follows the ten principles of good design, it is not perfect. There's room for improvement: Physical limitations and marketing decisions have introduced inevitable tradeoffs that need to be solved in future products. First, the current technology makes the iPad heavier than what some people—like Lam or Herrman's girlfriend—want it to be. For others—like myself or a waitress at Gizmodo's iPad launch party—don't find it heavy (perhaps because we use our right hands a lot). But the fact is that the iPad weighs 680 grams, which is roughly half of a netbook. That's not that much at all, but enough to be tiring if you are planning to hold it in one hand for an extended period of time (but then again, would you hold a book or a netbook with one hand standing up?). Unfortunately, the ID and engineering teams couldn't do anything about it. 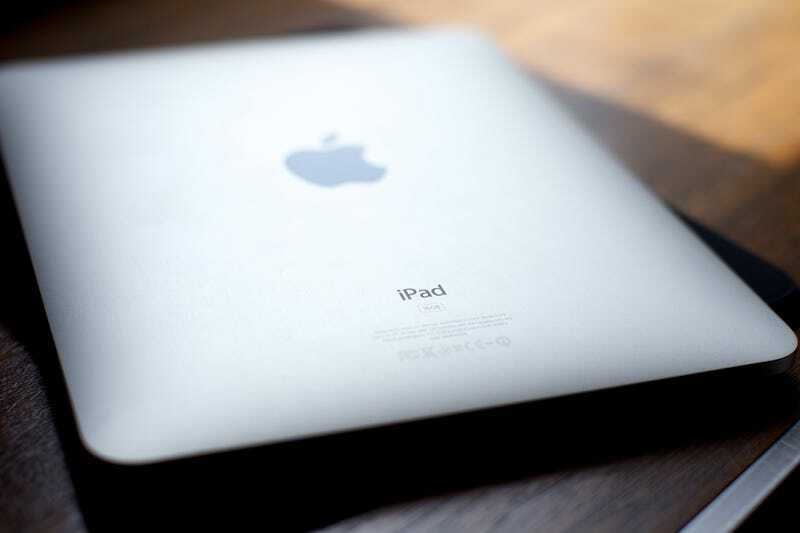 The iPad's weight is a necessary tradeoff, caused by its very dense packaging and the state of current technology: If you want an optical-glass-covered LED-backlit, a fast integrated processor, and the rest of the iPad features, you will need a large battery to make it run for more than 10 hours. There's no way around this. Apple's demo videos show people on couches and sofas using the iPad, while they hold it with two hands, against their legs while curled on the sofa, or against their crossed leg. They are clearly suggesting that people would handle the iPad like the handle book. Personally, this is how I use it, and how I have seen most people using it cafés and bars over the weekend. At home, I sit on the sofa or the toilet or lay on the bed. While on the sofa or bed, I may hold it straight for a while, then I would change to a different position, turn over on the couch or the sofa, put it against my lap, or over the bedsheets, and so on. When it comes to video I treat it the same way: I watched two episodes of Lost curled on the sofa, comfortably, changing positions just like I do while watching anything on the big screen. However, when it comes to video there is a need for a stand. Some people don't like to hold the iPad at all. They want to be 100% lazy, not using their hands (not for holding the iPad, anyway). In addition to this, there are people who like to watch TV or movies and do something else at the same time. Right now, my wife is seating on the sofa, embroidering an iPad sleeve (for me, she's the sweetest thing) while happily watching Weeds. She grabbed a pillow to put over her legs, which she has extended against the tea table, to place the iPad at an angle. Clearly, there will be occasions like this in which you will need some kind of stand. Apple assumed that, most of the time, this is not how you would use the device. Video is just one of the functions of the iPad. The main show is in the apps, most of which require the user to be engaged. That is why Apple designed this device to be treated like a book. Another unavoidable side-effect of the product functionality is the fingerprints. If you want a touch screen, you will get fingerprints. At least, until someone invents a glass that could completely repel body oils. The iPad is as good as it gets in this department, with an oleophobic glass that is easy to clean, but it gets dirty no matter what you try. Fortunately, looking straight at the screen will make the fingerprints visually disappear. But change the angle, get some reflections, and you will clearly see them. The only design choice that bugs me is the aluminum back. It looks beautiful, and feels nice on the touch, but I keep thinking: Could have they picked a better material so I could drop it anywhere without worrying about scratches or bumps? Perhaps rubberized plastic? What about carbon fiber to make it lighter? Could titanium be a better material? The iPad is hard, but I want it to stay pretty without having to put it inside a plastic cover. In fact, I want this thing to be nearly indestructible. Why did Apple choose 4:3? One of the reasons—perhaps the simplest one—is panel availability and cost. However, there is a clear functional factor, tied with the issue of the stand and how Apple imagined people would use the iPad when they came up with their functional specification. The iPad has the proportions of a paper page. It's a familiar format, which feels natural to humans, especially in portrait mode. A widescreen in portrait mode feels wrong. We just played with a JooJoo—which is 16:9—and that's exactly how it feels. The 4:3 proportion fits non-video content really well, with no waste of space. So while the user may end up with black bars or cropped video, Apple may have traded full widescreen video in favor of a format that works better with non-video content and applications. As new technology develops, new materials, smaller components, more powerful batteries will appear, and these problems will disappear. The next generations will get lighter while keeping the solid feel. They will be more powerful while increasing the battery life. They will have new features, like a front camera, while reducing their thickness. Eventually, they will be flexible and indestructible. And way cheaper than today. But despite not being perfect, this industrial design is the climax of all Apple products. The iPad functional objective was to make the product as invisible as possible, a simple, elegant stage for the real important actors: The applications. Applications that must run smoothly no matter what you do, with enough screen real estate to provide with great functionality. That's why the iPad—despite its weight and the fingerprints—is a perfect design. Click to viewAt the end of the day, when you hold one, "it's like holding the future in your hands." That's a phrase from Matt Buchanan, when I asked him what the iPad felt like. Seems like an exaggeration, but it isn't. It's what I feel too after playing with it for a day. Can the future get any better? Of course it will. It's only logical.